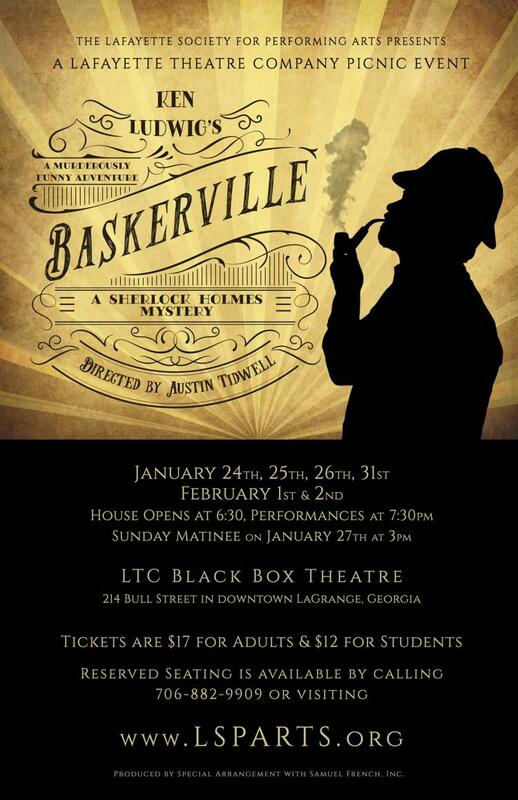 Comedic genius Ken Ludwig, (Leading Ladies, Moon Over Buffalo) transforms Arthur Conan Doyle’s classic The Hound of the Baskervilles into a murderously funny adventure. Sherlock Holmes is on the case. The male heirs of the Baskerville line are being dispatched one by one. To find their ingenious killer, Holmes and Watson must brave the desolate moors before a family curse dooms its newest heir. Join the fun and see how far from elementary the truth can be. LTC's Black Box Picnic Theatre is located at 214 Bull Street in downtown LaGrange, Georgia. The venue offers an intimate setting with 96 seats divided among tables, allowing guests to provide their own food and drinks for a meal before and during the show. The house opens one hour before performances. Concessions are available at each show, with a light bar added during mainstage/adult productions. Individual tickets are $17 for adults and $12 for students, with season tickets also available. Reserved seating is available. Tickets may be purchased online at click for details.